You guys! I’m so excited about this little project! 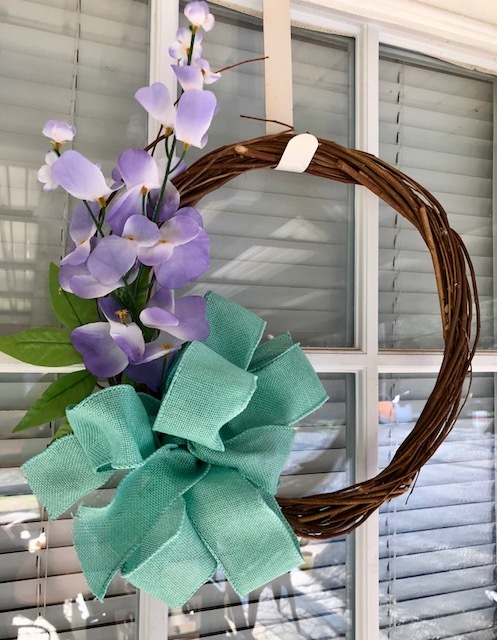 I made two wreaths for $7! 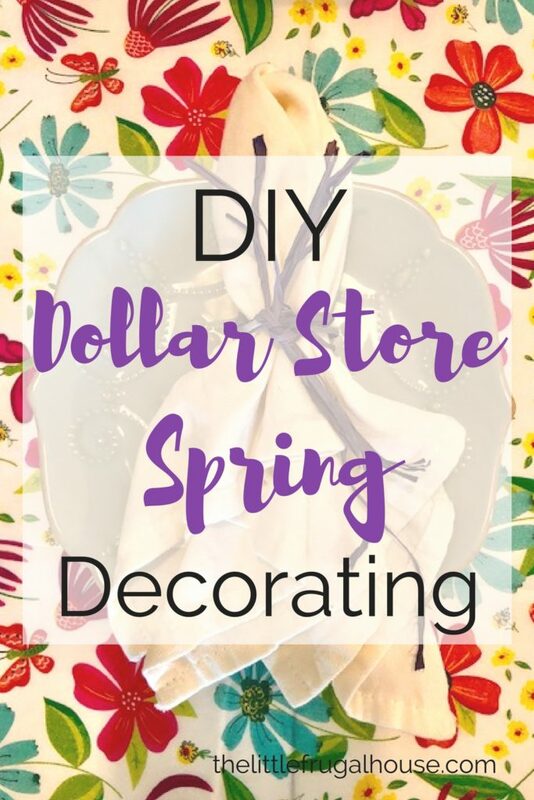 If you love the Dollar Tree like me, you will love making these DIY wreaths! 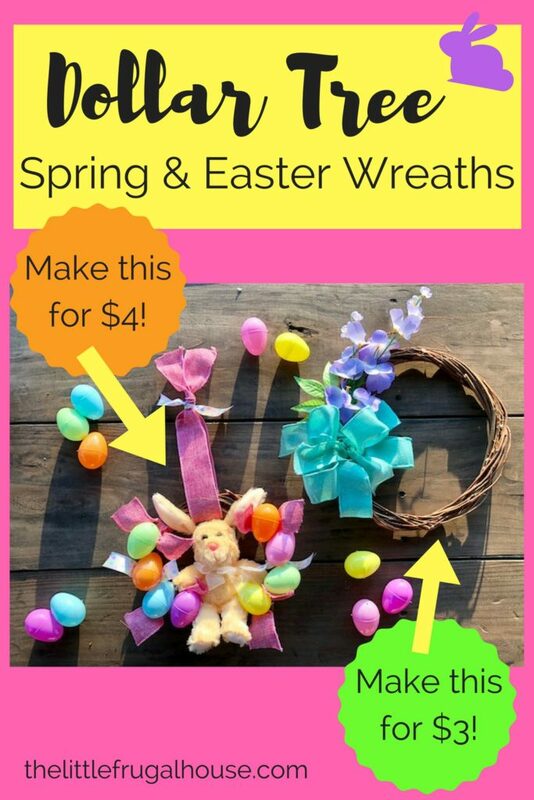 You can make the Spring wreath for $3 or the Easter wreath for $4 – or both! And in just a few minutes! 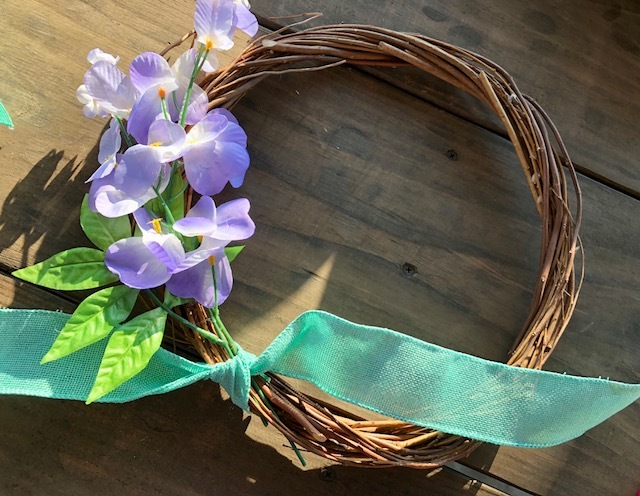 Trim the wisteria flower stem and hot glue on the side of the grapevine wreath. 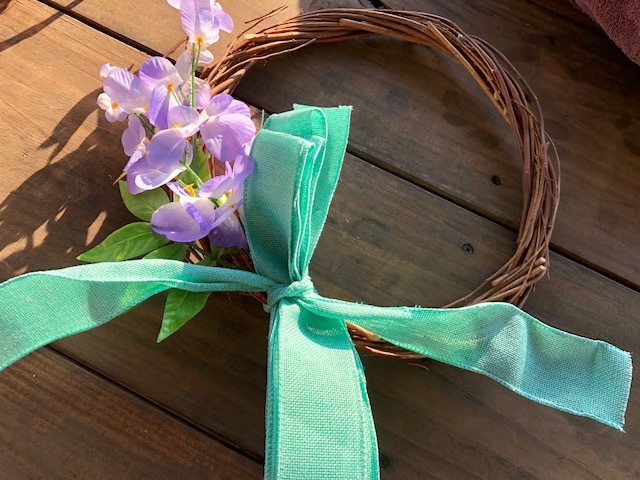 Cut a piece of teal burlap ribbon about 18″ long. Tie in a knot covering the flower stem. 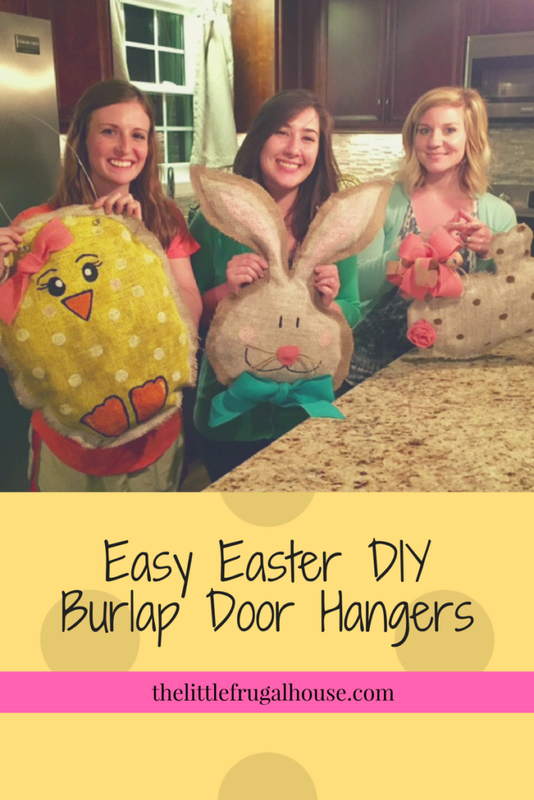 Fold the rest of the teal burlap ribbon back and forth in about 12″ increments. 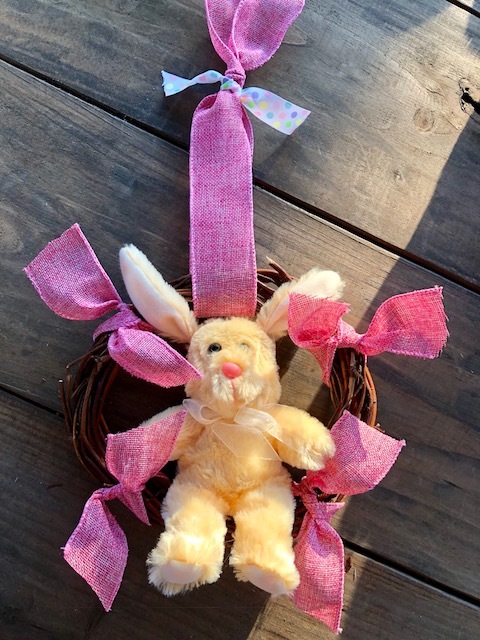 Place in the middle of your knotted ribbon and double knot. 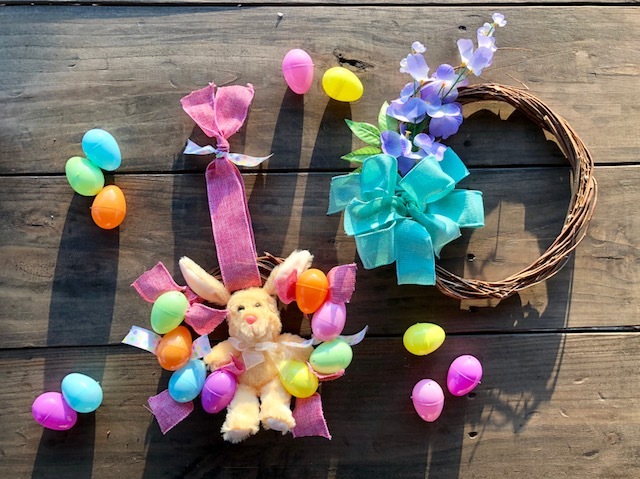 Fluff your bow out and hot glue in place. Can’t get any easier than that! 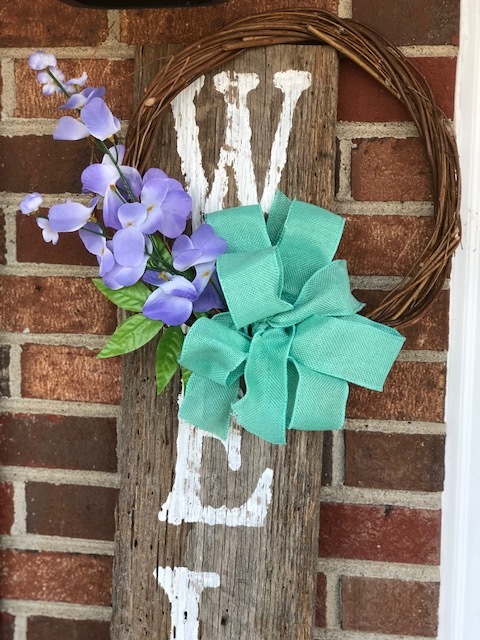 This DIY Spring wreath took me about 10 minutes and only $3! I love the way it turned out! 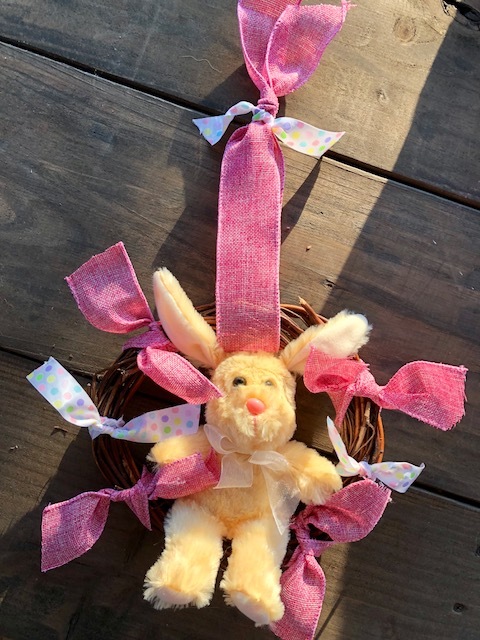 Cut a piece of pink burlap ribbon about 24″ long. 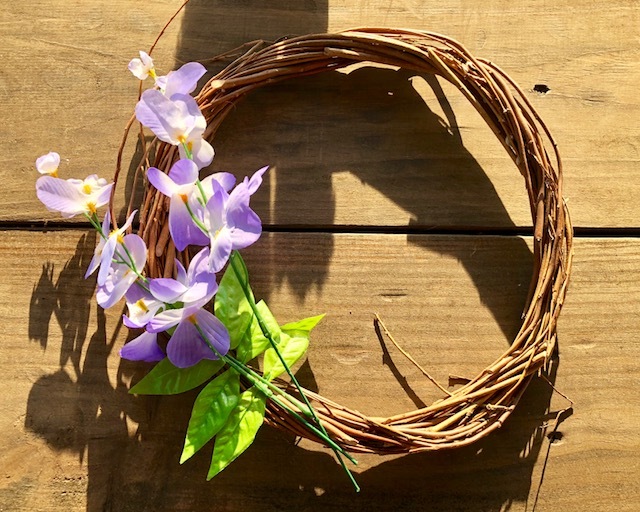 Make a loop around the top of your wreath and tie at the top. 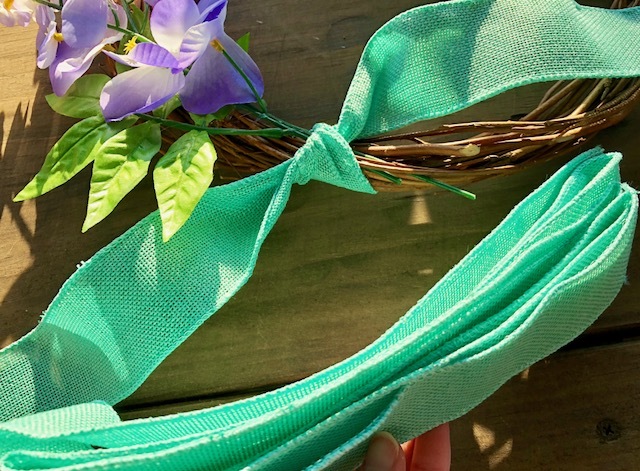 *If you have scrap ribbon, tie a small piece around the knot for extra color! 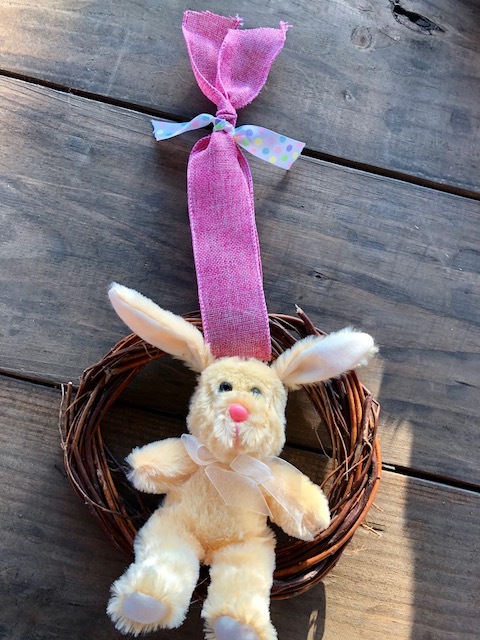 Hot glue your bunny to the bottom of the wreath and the ears to the top of the wreath. 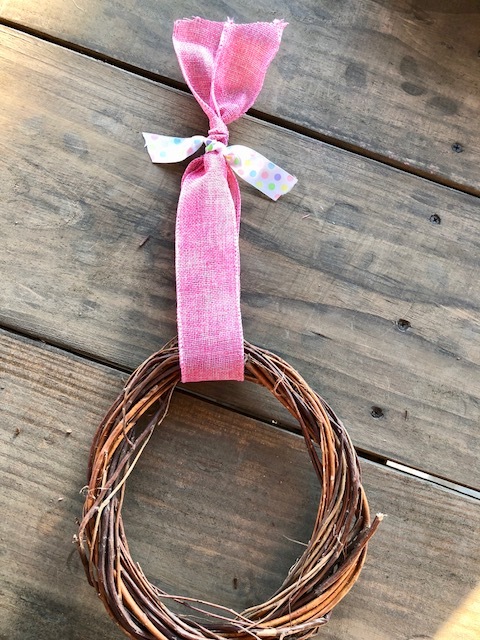 Cut 4 pieces of pink burlap ribbon about 10″ long and tie in knots around the wreath. Add dots of hot glue under the ribbon knots. 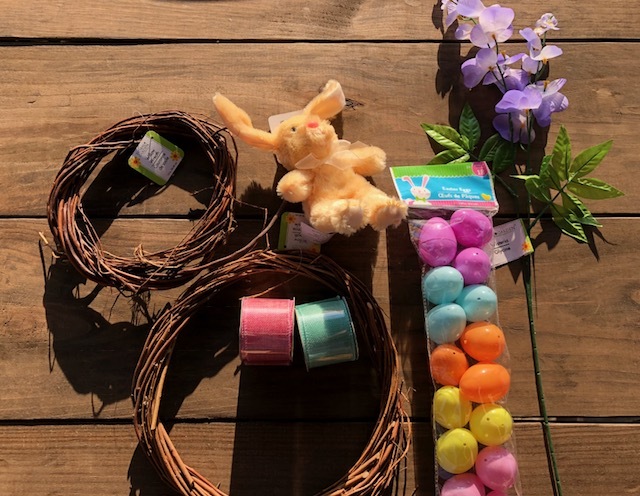 *Again, if you have scrap ribbon, tie some extra pieces around for more color! 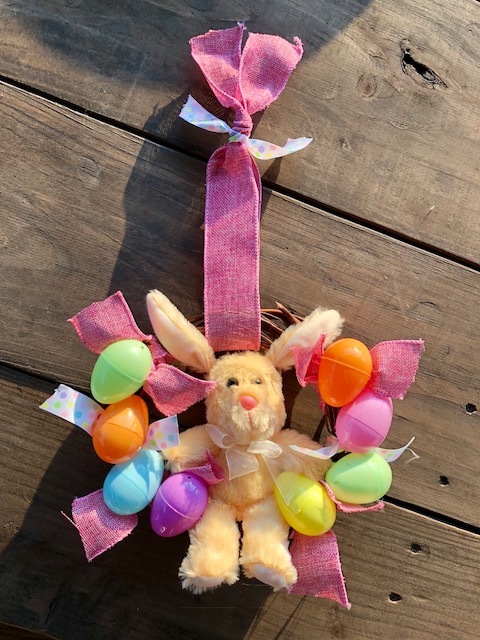 Hot glue Easter eggs around the wreath. 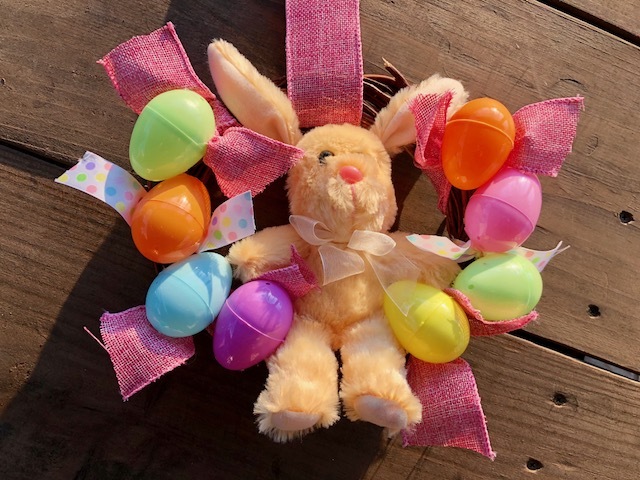 *You may want to hot glue your ribbon the the Easter eggs to help everything stay in place. 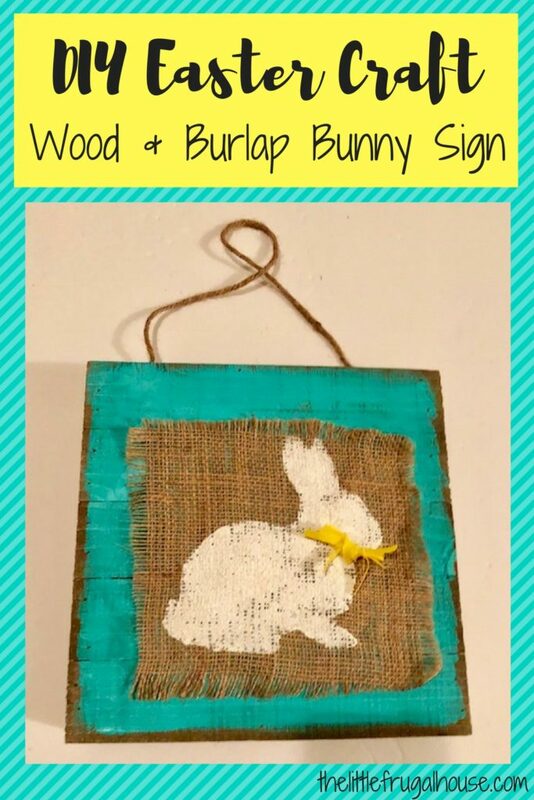 I think this one is so fun and cute! 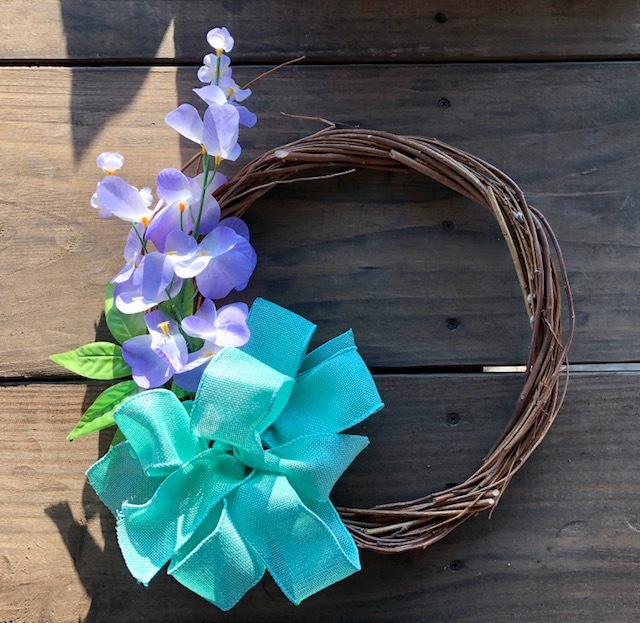 There you have it, two ways to make super cute wreaths with just a few dollars and a few minutes! Which one will you make? Share your favorite in the comments!